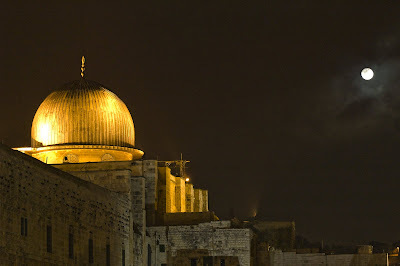 Jerusalem is one of the three holiest cities for Muslims, next to Mecca and Al-Madinah. It is the city where many of the prophets of Islam including Abraham and Jesus, preached and respected Jerusalem, Palestine, was the first “Qibla”, (direction to which Muslims faced when praying), during the entire Meccan period and the first 16 months of the Madeenah period. Muslims consider prayers in Jerusalem’s Masjid Al-Aqsa to be equivalent to 500 prayers in any other ordinary mosque. Jerusalem is extremely important to Muslims and they will never accept for it to be occupied by military force. The tradition in Islam states that the area of Jerusalem and of Mecca will be connected together at the end of time, the Day of Judgment. The Holy Lands will be the special point of proximity to Heaven on this future date. For Muslims the area has a special significance, as the site of the Prophet Muhammad's Night Journey, peace and blessings be upon him, and as the first qibla (direction of prayer) for Islam. In the ninth year of the Prophet's mission, about 620 AD, Muhammad (pbuh) rose in the middle of the night to visit the Sacred Mosque in Makkah. After a time of worship he fell asleep near the Ka'aba. The angel Gabriel came to him and woke him from his slumber. He led the Prophet, peace and blessings be upon him, to the edge of the sacred Makkan mosque. Awaiting them was al-Buraq, a white winged beast "whose each stride stretched as far as the eye could see." Muhammad mounted al-Buraq and sped northwards with Gabriel to Al-Aqsa Mosque in Jerusalem, the Furthest Mosque. When they reached Jerusalem the Prophet dismounted and prayed near the Rock. Abraham, Moses, Jesus and other prophets, peace be upon them all, gathered together to pray behind him. Muhammad (pbuh) was presented a vessel of wine and a vessel of milk. The Prophet chose the milk and Gabriel said, 'You have chosen the true religion'. Jews and Christians also recognize Prophets David and Solomon as great kings and patriarchs of ancient Israel. However, in Islam they are honored as Allah's great Prophets. The Quran not only narrated their stories, but also restored their honor by removing some of the charges and allegations that were made against their characters by earlier communities. Since the city of Jerusalem is historically associated with these Prophets of Allah, it naturally becomes a city sacred to Muslims. Islam considers itself a continuation of the same spiritual and ethical movement that began with the earlier Prophets. Jerusalem came under Islamic rule during the reign of the second Caliph Umar (mayAllah be pleased with him) in the year 638.It was a peaceful conquest. The ruling patriarch of the city, whose name was Sophronius, offered the keys of the city to the Caliph himself.Upon entering the blessed city, the Caliph asked about the location of the mosque of David (al-Masjid al-Aqsa) and the blessed Rock from where the Prophet went in Miraj. The site was a desolate place at that time. Romans had destroyed the so-called Second Temple in the year 70 CE and no non-Christian or Christian ruler of that city after that ever tried to build any place of worship there. According to historians, it was a garbage dump, a dunghill for the people of Jerusalem.Umar, upon learning this was the site of the Masjid of Jerusalem and the place from where the Miraj took place, cleaned the place with his own hands and put his forehead in payer on that ground. The Masjid al-Aqsa was later built in that area. 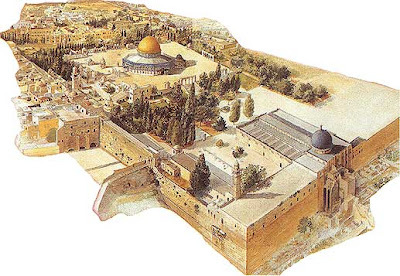 In 691 CE the Dome of Rock and a more elaborate mosque were constructed. Those were, perhaps, the first most expensive and expansive sacred monuments built in thehistory of Islam. Jerusalem was always held in great esteem by Muslims. The Prophet said, "Journeys should not be taken (with the intention of worship) except to three mosques: the Sacred Mosque in Makkah, my Mosque in Madinah and Masjid al-Aqsa in Jerusalem." On the basis of this Hadith, Muslims always considered it as a religious deed to visit the city of Jerusalem, its mosque and its sacred and blessed precincts. Often pilgrims made it a point to visit Jerusalem on their way to Makkah and Madinah. Under Islamic rule they were given permission to settle there. When the Caliph Umar made the treaty with the Christian Patriarch Sophronius it was agreed, at the request of the Christian patriarch, that "No Jews will live with them in Aelia (Jerusalem)." But later, due to Muslim tolerance, this rule was relaxed and Jews were allowed to come and settle in the city. Wonderful sights were to be seen. Some of our men (and this was more merciful) cut off the heads of their enemies; others shoot them with arrows, so that they fell from the towers; others tortured them longer by casting them into flames. Piles of heads, hands and feet were to be seen in the streets of the city. It was necessary to pick one's way over the bodies of men and horses. But these were small matters compared to what happened at the Temple of Solomon, a place where religious services are normally chanted ... in the temple and the porch of Solomon, men rode in blood up to their knees and bridle reins. In two days, the Crusader army killed some 40,000 Muslims in the barbaric ways just described. The peace and harmony in Palestine, which had lasted since Omar, ended in terrible slaughter. The Crusaders violated all the ethical laws of Christianity, a religion of love and compassion, and spread terror, allegedly in the name of Christianity. The most famous of the Muslim military heroes was Saladin (SALAH AD-DIN YUSUF IBN AYYUB). In the late 12th century he succeeded in uniting various parts of the Middle East and Mesopotamia and in overtaking the Christian armies of the early crusades through a combination of shrewd diplomacy and decisive attacks. Saladin was born in Takrit, Mesopotamia (in modern Iraq) to a Kurdish family. As a youth, his pursuits tended more toward the religious and scholarly than toward the military, but this changed when he joined the staff of his uncle, a military commander. By age 31 Saladin became commander of the Syrian troops and vizier of Egypt. In the following years, Saladin used his considerable talents to bring the Muslim territories of Syria, Egypt, northern Mesopotamia, and Palestine under his control. Then, in 1187, he launched Jihad against the armies of the European crusaders, who had conquered Jerusalem 88 years before. In contrast to the European conquest of Jerusalem, Saladin's capture of the city was far more civilized and less bloody. By 1189 the crusaders occupied only three cities in the entire Middle East. Saladin's conquest sparked the Third Crusade, which was led by the famed military leader Richard I (the Lion-Hearted). The clash between these two great powers ended in a draw, but a treaty was drawn up that allowed Christians to visit holy sites in the area. Saladin died a peaceful death in Damascus in 1193. Muslim sultan of Egypt, Syria, Yemen, and Palestine, founder of the Ayyubid dynasty, and the most famous of Muslim heroes. In wars against the Christian crusaders, he achieved final success with the disciplined capture of Jerusalem (Oct. 2, 1187), ending its 88-year occupation by the Franks. The great Christian counterattack of the Third Crusade was then stalemated by his military genius. On 2 October 1187 Saladin and his army entered Jerusalem as conquerors and for the next 800 years Jerusalem would remain a Muslim city... Saladin kept his word, and conquered the city according to the highest Islamic ideals. He did not take revenge for the 1099 massacre, as the Koran advised (16:127), and now that hostilities had ceased he ended the killing (2:193-194). Not a single Christian was killed and there was no plunder. The ransoms were deliberately very low. When Saladdin recaptured the city from the Crusaders, Jerusalem regained once again its glory, where Christians were guaranteed rights of worship, Muslim places of worship which had been desecrated were restored, even a small Jewish community returned to the city, and Jewish culture has seldom flourished as they did under Muslim rule, that's how the spiritual significance of Jerusalem has been absorbed by all three religions. Muslims on the other hand have an obligation to honor other religions. There is recognition, a respect for both Judaism and Christianity as people of the book, mentioned in the holy Quran. I guess it would be a pity for Jerusalem, the supposed city of peace, were to be transformed into a city of war as a result of Israeli plans, which ignore its significance for Muslims.